Would mixing in stuff that would go into a compost pile into the garden at the end of the season be the same as composting? I want to compost but the people I share the house with are not willing to work with me in that regard. Last year I used my blower vac to blow my leaves into a pile during the fall and then vacuumed them up. Which basically shreds them into lots of tiny pieces. After all the leaves fell and were gathered up this way I mixed them into the garden using the tiller. Unfortunately I don't think I'll have the gas powered tiller to use going forward. Thanks for any help and advice. While I've laid horse manure over fallow garden beds in the Fall & allowed it to "compost" naturally for a good six months or more before turning it under, trying to do the same thing with kitchen scraps would most likely attract a lot of unpleasant pests. Those sorts of items would have to be buried in a pile, as in composted traditionally. Do you really need your housemates help/approval to compost? Last edited by GardeningCook on Thu Jun 11, 2015 2:50 am, edited 1 time in total. We do co-own the home so it is a courtesy to each other to consult each other in terms of household related things like this and come to a mutual decision. Kitchen scraps, coffee grounds and such would need cooperation to be placed in a bin or pile. And without cooperation of placing such items in or approval of having the bin or pile would I fear just cause problems. I'm wondering if there perhaps is a middle ground that can be reached. Any ideas? Are your housemates reluctant to use a countertop compost bin/can to throw kitchen scraps into if you do the duty of taking it to the outside bin to empty it? Therre are some nice-looking counter bins that have filters in them so they don't stink up the house. An outside tumbler can -- metal or plastic -- can be used outside to contain the compost so it isn't unsightly. Might that be agreeable? Lots of people do it. I haven't tried it and I have wondered about the critters. I have lots of raccoons and many other critters around my yard. If my compost pile/ bin does not have a lid on it, they will get into that, eat the scraps out of it and strew stuff around. If I plant things with fresh compost (not entirely broken down) or fish emulsion in the planting hole, they will dig up the plant to get to it. So why wouldn't they dig up what is in the trench? (I never put meat in my compost, doesn't matter, critters still love the kitchen scraps.) I guess the answer is making a pretty deep trench. Put leaves and stuff on top of the kitchen scraps and bury the whole thing well. The objections were pretty much everything you guys mentioned. I countered all the objections with not if done right and if a nice looking bin is used etc. But still it was objected to. The counter offer was go out and buy the compost every year. But that seems counter productive to me. The idea of growing the vegetables I do is to save money. So I don't know what to do. To me it isn't a big deal and is as simple as throwing stuff in the trash but instead putting it to good use. My general impression is no matter what I say I'll get stonewalled. Which is why I was hoping perhaps there was some middle ground where it isn't compost but is kind of thing if you get what I'm thinking. If your housemates don't garden it can be a problem. It would help if they were interested. Pit composting might be the most aesthetic way to go. One people don't like to see piles of waste collecting in the kitchen or pails because they smell and attract critters. If you don't have a lot to bury on a daily basis, bag it and freeze it if you have freezer space. It won't smell and as long as the freezer space is not a premium it will work. When you have enough to make it worthwhile put it in the pit. Pit composting out of sight. You would put your pit in your fallow plot. dig a hole and slowly fill it in with the scraps. If you have things that will dig it up, you may need to dig a deeper hole. Freezing actually helps break some of the greens down so it decomposes faster. 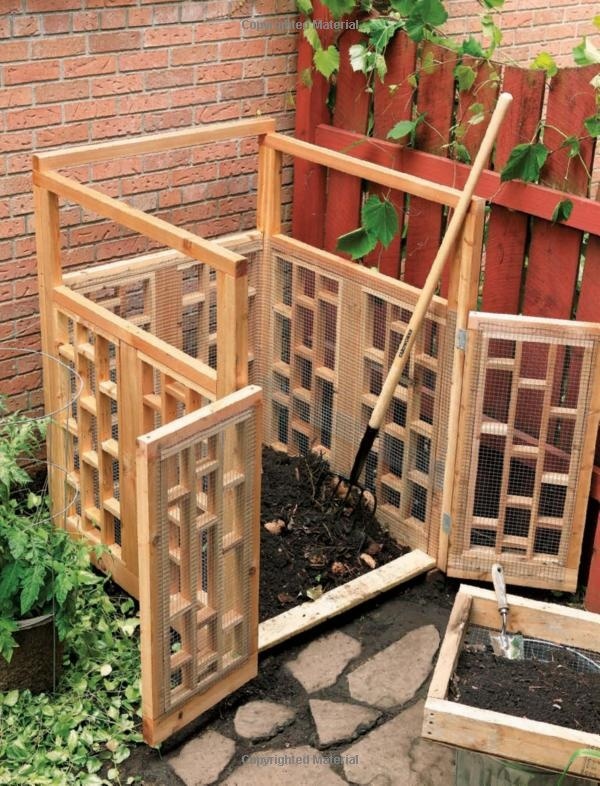 Add a little of the soil you took out to cover and put in some browns and cover with a board, so no one falls in the pit. If you have creatures that like to dig holes, put something heavy over the board. Keep the rest of the bed mulched to keep weeds down and so it looks nicer. Mulch over the board so they don't see the board. When the pit is full, dig another one in another part of the bed. 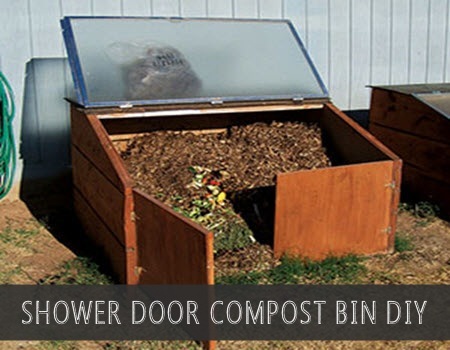 Next growing season switch, plant your veggies in the composted bed and start pit composting the other one. Oh this might work. Could I use the walk ways of my garden as the pits? I'll have to find something to cover the pit(s). Compost sinks and you want walkways firm. you would alternate the beds on either side of the walkway for the pit and the fallow bed. I just use a sheet of plywood or plywood scrap. Sometimes at the hardware store they have pieces of scraps from cut pieces, a table round or I can buy a a 2ft x 4 ft sheet of ply board instead of a full sheet which would not fit in my car anyway. If you know construction people or hang out around construction sites sometimes you can pick up scarps that they might otherwise throw away. Pallets are often free for the asking at industrial parks. You can use them as is or take them apart and use the wood to build a cover. I have even used an old metal garbage can lid. I go to the convenience center to drop off weeds and sometimes I one man's trash is another's treasure. I asked someone for a 5 gallon bucket with a broken handle they were going to throw away. It is perfectly good for planting a pepper and I have picked up other buckets I used for weeds. Ha I just answered JamesL's weeding question with a similar solution using yard waste and was wondering if this thread was going to create a conflict because he wants to compost and I just told him to use the ingredients as mulch. I'd say just bury the scraps under the cardboard and mulch but if you have a trench in the walkway covered with plywood, covered with mulch, that would serve as well. Personally, I would look into how plywood is constructed and consider the pressure treated/exterior plywood issues first though. Scrap lumber of all kinds are not that hard to come by. For collecting the kitchen scraps, I use a 2 gallon bucket with a tight lid like laundry products and kitty litter come from, and keep it under the sink. As long as the lid is on tight, there is no smell and it is convenient. When it is starting to get full or to get unpleasant to open the lid, I take it out and dump it on the compost pile and cover it with fall leaves or straw or paper. I keep at least a couple buckets around so that one can be airing out, while the other is being used. this one has air holes, but has charcoal filters in the lid. Things like this come in all kinds of designs and materials, including enameled metal and stainless steel. But you are right, having compost for your garden is great (and your homemade compost is way better than some substance made from mystery ingredients that has been sitting in bags dying for who knows how long), but it is only half of the reason for composting. The other half is to keep all those kitchen scraps, garden trimmings, weeds, etc out of the waste stream. 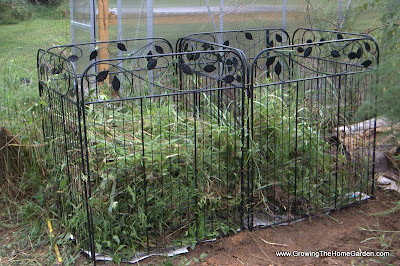 Why add stuff that could be gold for your garden to the landfill problem? Obviously the co-operation of your housemates is essential to the success of your compost project. Do they respect the rewards of your garden (do they like vegetables)? Do they help you with the gardening? Perhaps you could engage them in the process (harvesting is always fun). All things come at a cost. You are right that it is wasteful to bag up and help top off the landfill with the leaves and household scraps from your kitchen. The trees send roots deep into the earth and drop their waste (mineral, nutrient rich leaves at your feet) each fall. To trash them and then go out and buy 'compost' and fertilizers is not only wasteful, it is absurd. As to trench composting under garden pathways, I have been doing this for several years. I don't use kitchen scraps, just a 2 to 1 blend of leaves and grass clippings. At either the end of or the beginning of the season, I lift up the boards, dig up and spread out the composted material and then refill and replace the boards until next season. There might be a little instability to the boards at times, but nothing that would knock me off my feet. The fact that the boards are walked on consistantly keeps things pretty evened out. I would avoid any painted or pressure treated wood. I don't know if the adhesives and chemicals in plywood are food safe, but just like the formaldihyde in particale board, I would avoid them. I use some found 2 x 6 boards that work well. As you said - 'Last year I used my blower vac to blow my leaves into a pile during the fall and then vacuumed them up. Which basically shreds them into lots of tiny pieces' This obviously excelerates the composting process. In the same light, I take my kitchen scraps to the food processor and make a nice ground mush of it all. With my open-pile compost in a well wooded (and animal friendly) neighborhood, this works well to keep the deer, racoons, dogs, rats and others at bay. Much depends on how 'manicured' your property and neighbood is. Bins are good (lids are essential) but are not as easy to manage as open piles in my experience. But keeping housemates and neighbors happy is very important. Baby steps. Looks like there are several ways to go to help keep things tidy and workable. 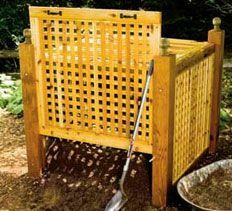 Trench composting is nothing new, and just a method to work with kitchen scraps and help the garden soil. One can dig a narrow trench down side or middle or across (whatever!) garden. Just dig a few feet out. Daily dump your kitchen scraps, cover with that dirt piled on side, and just keep working down the trench. Just dig trench out a few feet at a time, and keep working it around your garden. You still need a proper bowl on the counter, and can be creative in looks and function. A 2 qt one big enough. Put coffee grounds with filter, tea bags, peels, stems, egg shells etc in it, take out daily. When you pick produce and have extra peels and stems, and rottie pieces, set up an extra bowl while processing, and then dump. Not rocket science! 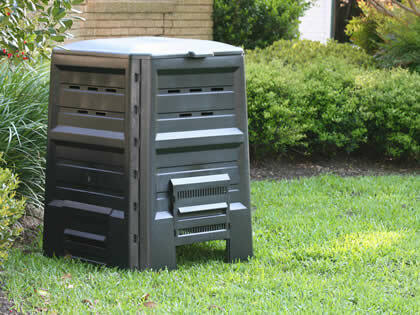 Another option is a compost tumbler. I got the small one from Mantis this winter. Again, take stuff out daily, give it a turn. I'm still on my first go around with mine, and think I got heavy with browns (I just throw in handfuls of leaves still around from fall). If you work both a tumbler and the trench, can easily work 12 months, rain and snow. Well it looks like we have a solution. I can obtain scrap wood from somewhere here in town I'm sure to provide a cover to the walkways to compost in trenches in them. The big bucket with lid for scraps may be a solution to get cooperation on the inside of the house. I believe the out of site farthest away from the house where the garden is under the walkways of the garden has convinced that it's not a negative thing to have. I'll see tomorrow on how the bucket inside the house goes over. There appears to be some overlap for grass clippings with my weed thread. If I use dried grass clippings for mulch can those be tilled under at the end of the season into the garden and benefit like if they were compost? EDIT: I should add that I have a couple fertilizers I bought last year that I didn't use this year. Should I use them too or will composting result in keeping thet nutrients I need year to year? I also asked about them in the weed thread since now these two seem to be on a parallel course of relationship. Sounds like you are coming to a solution. Bravo. Re: grass clippings; if you do a quick search in this forum for balancing 'greens and browns', there's a lot of good posts that will help you keep a healthy compost. Good luck.